8 miles. emigration market loop. i went out 30 minutes earlier than i usually do, and it was 30 minutes scarier. gold's gym was still closed. no one was cutting fruit in the window at harmon's. not a soul in liberty park. the only sign of life i encountered was at the chocolate factory -- thank goodness they never close. i had time for a shower (first one in seven weeks) and breakfast and made it to work by 6:05am. i'm just eager on monday mornings, what can i say?!?!?!?! ha. hahahaha. AHHHHHHH! dun da duh duh dun dun duh duh beep bop. i wanted some extra motivation and inspiration today, so i ran with devra and andrea, two of the best in the business. it was hot, dry, and windy, but luckily i was prepared with my long sleeved shirt (thanks, KSL weather center). we stopped at a bathroom on the JRP about 2.5 miles into the run. i splashed sink water all over me, andrea chilled in the shade, and devra commented on how nice it felt to stop. the take away inspirational quote of the day: "i'm so glad we are running short today." i'm feeling very loose and rested right now, and as far as i know that is a good sign. i'm also feeling oddly relaxed about saturday, but it's not because i'm feeling confident. if anything, the subdued feelings about the race are coming from the fact that i'm underconfident in my abilities right now, and as such i'm not putting as much pressure on myself as i have in the past. i'm bib #2002 this year, after four straight years of holding the magic #2001 -- as silly as it sounds, i feel less pressure in that i'm not pinning THE target on my singlet. i put an incredible amount of pressure on myself last year, as i really, really wanted the repeat win. i was also caught up in a post-stress fracture disney sports movie fantasy and thought i had something to prove. top of utah was my only marathon for 2011, which made it ultra important to me because all of my eggs were in that one shopping trolley. this year is shaping up to be a lot different. i already know the field is deep and talented, so i'm not fretting about how things will play out or wondering who is or isn't going to show up. plain and simple, saturday is going to be a race from start to finish. i may or may not be capable of running under 2:50. i'm certainly going to go for it, but if it doesn't happen, i'm pretty sure life will go on (in fact, it must go on, because i want my post-race feast). if it does happen, of course i will be very happy, and my post-race feast will be even bigger. devra suggested i toss my watch and just run, and i am considering doing that (she experienced my fretting during SLC earlier this year and knows i can be a bit crazy). maybe this post sounds like i am unmotivated or unfocused, but i don't feel that way. i am still motivated to run and run hard on saturday, and i fully intend to be in the mix if i am capable of hanging. i'm just not letting myself get wrapped up in the hype and nerves that i usually create for myself (it's super hard to untangle and it gives me split ends). i'm only setting myself up for failure and disappointment if i put too much pressure on myself to hit a certain place or time. i've done that for the three other marathons i've run this year, and i haven't been too happy about any of them (poor james has had to experience the aftermath). i am very excited to run and see what i can do, and i hope i can continue to stay relaxed and run without weight on my shoulders (it's more in my thighs this year anyway). any burdens or pressure that i've felt in the past have been of my own creation, and i'm just not letting that happen this year. 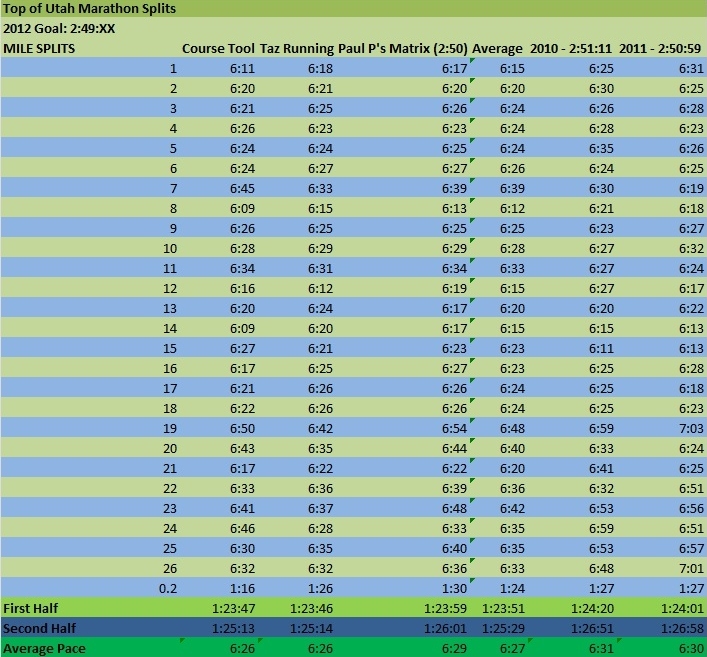 the top of utah marathon is my all-time favorite race, and i just want to go out and enjoy it as i used to (like my first one in 2005 when i stopped to take pictures of the fall leaves!) ha. whatever the outcome, it's going to be a great day -- just check the weather forecast! anyway, there's my spiel for the week. i had a few characters saved up from last week (including an enormous amount of parentheses), so i thought i should use them before they spoiled. wow, today was a race! the top five female finishers all went sub-3, with the top two going under 2:50. it was great to see so many people run so well, particularly jake (men's winner) and rachelle (sub-3!). i am content with the outcome of my race today, although i'm left with a hole in that i didn't fulfill my ultimate goal of breaking 2:50. i knew the goal was a stretch, but after analyzing the course to death and coming up with target splits that would get me across the line in 2:49, i really believed that i could do it. i felt that my times on this course over the past two years showed that i had it in me if i had a solid build up and a perfect day. i'm left wondering if i was just kidding myself today, or if i really can do it if things come together perfectly (which rarely happens, but it's something you always hope for on race day). i started out with a 6:15 mile, which was faster than normal but it felt right and i was just going with the flow. it actually felt very easy and i was in this wonderful party pack consisting of the top four women and a sea of male runners. everyone was chatty and in good spirits, and the fact that i was feeling so good made it all the more fun. it wasn't long before the pack split into two -- the men + cynthia moved ahead, and a smaller pack with me, janae, stefanie and a few random guys joined together. we went through the second mile in 6:40, consciously slowing down after the 6:15 start, although we all agreed we over-compensated and ran it a bit too slowly. it takes a few miles to dial it in, and all of us were looking for 6:20 - 6:30. we hit 6:20 on the mark for the third mile, and stayed relatively consistent throughout the canyon, with minor fluctuations based on the undulations in any given mile. our chase pack stayed together through the first 14 miles of the canyon, with random guys dropping in and out as people were settling into their paces, or realizing they went out too fast. :) .those first 14 miles with janae and stefanie were rather unnerving. it was very motivating to be running next to them, but the miles seemed to be going by quite slowly (odd for this race; i've always found that the canyon miles just fly by). we were all running in sync, and at that point no one had blinked in terms of letting on they they were tired. everyone's breathing was quiet and relaxed; the only sound was our footsteps and the occasional sniffle. it was actually kind of eerie, running along in silence, knowing we were all thinking the same thing: how is this thing going to play out? although the outcome of a marathon can never be predicted that early in the race, it was reasonable to assume at that point that we were in the running for second - fourth place. who was going to make the move? who was going to get dropped and when? would this continue to be an epic battle all the way to the finish line? my mind was swirling with these questions, and i couldn't seem to shut it off. i was right in the thick of a very real competition; it was incredibly exciting and incredibly scary. my swirling mind turned into a full-on tornado when we rounded a corner and saw james up ahead, visibly slowing. eventually he started walking, and that made my stomach drop. he promised me that he would stop at any signs of trouble, and i wasn't sure just how "in trouble" he was. i couldn't wait to reach him. we caught up to him and he jumped in with us and started running again. i asked him if he was okay while simultaneously telling him that he needed to drop out. he considered running with us at our pace to see if he could hang on, but i shot him a "please no" look and he agreed to drop. we both knew it was for the best. he assured me several times that he was okay, although i was unsettled about it until i saw him cheering on the side of the road at mile 24, fresh off the sag wagon. i know dropping out was a very difficult thing for him to do, but i also know that his decision averted a much bigger setback, and i am proud of him for being smart and pulling the plug when he did. the next few miles were kind of a blur. the literal blur came from the canyon tailwind that was whipping my untamed hair into my eyes. i was also in a mental fog thinking about james and feeling guilty that i had left him in the canyon with no assurance that he had a way out. in addition, i was still very much involved in, and trying to process the exciting race going on in the present. still, no one had cracked, but i was starting to feel uncomfortable. i was very tense and couldn't get my shoulders or back to relax. i started feeling like i was forcing my stride and working a bit too hard for only being halfway through the race. we came out of the canyon at mile 14 and made the turn onto hollow road -- the place where i usually clock my fastest split of the race. today's split was frustratingly average, and i knew the rest of the race was going to be more of a challenge than i had planned. i just wasn't "on" today. something was missing -- an extra gear, courage, mental clarity, willpower, fancy earrings -- i'm not sure what it was, but i knew that when the true battle commenced, i had a chink in my armor. admist everything going on within this blur, i DO remember seeing tara. she was so awesome and so helpful. she ran with us for a moment and it was very motivating to hear her cheers and words of encouragement. i saw her several more times along the course, either on the sidelines or cruising by in her sweet van, but each time she was helpful and said just what i needed to hear. i felt like a fragile piece of glass, and every time i was about to shatter, i would see/hear tara, and it gave me the motivation i needed to reverse that thinking and not allow myself to break. mile 16. time for the move. janae made a commanding surge just before we exited hollow road. stefanie had dropped back about a mile earlier, but remained within striking distance and seemed to be holding together well. i surged twice to try and cover janae's move, but it was fruitless. it was very obvious that she had kicked it into another gear -- a gear that i did not have. as hard as it was for me, i let her go. the only thing harder would have been to go with her, but that would have meant a royal blow up within the next mile or two. now i was running alone -- time for the fatigued legs and labored breathing to flood my thoughts. up to this point, i had been able to ignore it because i was concentrating on sticking with janae, but now that she was gone and was rapidly pulling away, my mind started to drift. why can't i focus? it was so difficult today. the next several miles are slow with turns and undulations. even though the fatigue in my legs was increasing, and my breathing continued to spiral out of control, my splits were showing me that i was still alive and that i was actually hanging on okay given the difficulty of the miles. this was encouraging, and i was lifted from my lull i had experienced in miles 17-18. janae continued to increase her lead on me, and eventually she was no longer visible. it would take quite the blow-up on her part in order for me to catch her, and i was pretty sure that she was in no danger of hitting the wall. she had been solid through 16 miles -- her form never broke and she wasn't breathing at all (actually, she was breathing, and thank goodness, but my point is that she was incredibly relaxed). stefanie was running about 40 seconds behind me, and this is what kept me going. i knew that if i let up in any way, there was a very real chance that she would catch and pass me in those final few miles. first place was gone. second place was gone. i was desperatley clinging to third. please. don't let up. don't let up. miles 19-22 are arguably the most challenging of the course. i just focused on getting through those tough segments to 22, and then told myself i needed to put out two more strong miles to get to 24, however hard they felt. if i didn't do this, it was likely i was going to get caught from behind. i had to keep myself going. despite my efforts, i was only able to eek out a 7:08 and a 6:58. good enough to hold my position, but not good enough to keep my hopes alive for a good time (at this point, a good time was defined as 2:51-ish). i was sure i dropped myself to 2:52, and maybe even more than that. i was working so hard, so seeing the 7:08 was maddening. i saw james just after the mile 24 mark -- so relieved to see he was doing fine and found his way down the canyon. i turned onto main street and my eyes immediately focused to the hill ahead. the challenge. i actually fared okay up the hill and kept the pace up, although at this point the pace was 7:00. it felt like 5:00 pace in my lungs and 10:00 pace in my legs. confusing combination. the last mile was my slowest of the race; i could only muster a 7:27. this was very disappointing for me. the only thing i find cool about my finish was that i covered the last .2 in 1:27 -- not super fast by any means, but it's the exact same pace i finished in both 2010 and 2011, so at least i'm consistent in my stumble to the finish line. probably the most disappointing stat of the day is my huge positive split -- 1:24:27/1:29:13 -- way too much time lost in that second half. i ran the second half in 1:26:58 last year, and 1:26:51 in 2010, with both of those years clocking slightly faster splits for the first half. i can't really say why i slowed down so much more this year. my mileage has been more consistent than ever before, and i really thought i was prepared on the endurance end. again, i truly believed i could break 2:50 today. whether or not it was wishful thinking, i'm never going to do it if i don't think that i can. i've raced four marathons this year, and in each one i didn't quite achieve what i set out to do. part of me looks back in frustration and dissatisfaction on the epic-marathoning-year-that-wasn't, but i also can't ignore the fact that i've been able to race and compete in all of these marathons this year. i was healthy for each one, both during training and the actual races, and i most certainly do not take that for granted. my mantra and #1 goal all year has been "no injuries in 2012". i know there are still a few months to go, but as far as racing season goes, i made it through unscathed, and i had some incredibly fun and incredibly tough racing experiences along the way. even though i may not have met any of my "ultimate goals" for the year, i can't really ask for more. the marathon is one of the most unpredictable events out there, and the things that i have learned through my races this year will hopefully be of benefit for the future. i haven't seen any progress this year in terms of dropping my times, but i have learned a lot through the new and different challenges i've faced within each race. i've learned more about how to compete. i think my biggest challenge this year was dealing with the mental aspects of racing. i just didn't respond well to some of the situations i was in, and i have to learn to keep a clear head and not over think every little thing or get bogged down by the "what ifs". although i know the physical aspects are just as vital in this sport, i think growing mentally is a big key to finding success in future races. in the end, no marathon PR for me this year. over the last few years, i have whittled my time down to 2:51, often shaving off minutes at a time. i am now recognizing that it becomes vastly harder to knock off even the smallest of seconds as i get closer to what i feel is my maximum potential. until i make some big changes in my training, which for now won't be much due to the logistics of life, i can't see myself doing much more damage at this distance. that said, i'm not giving up. it's all about timing, and when the timing is right, i'll revamp and find out what i need to do to make the next tiny jump in this gigantic distance. finally, i just want to give a shout-out and thank you to everyone who has been so supportive and so kind. the day-to-day comments and encouragement have helped me immensely. a shout-out to james for enduring my post-race antics four times this year, and always lending an ear and words of encouragement to never give up. finally, a huge thanks to jake and andrea. they arranged a sweet set up for all of us this weekend at a really nice guest house in smithfield (that included a cold creek for icing!). i'm telling you, these two will do anything for anyone, and they have always been so kind and generous to us. we really appreciate it. one of the greatest things that comes from running are wonderful the people you meet (namely, james) and the awesome friendships you develop (all of you).